Snug Vest, produced by a Vancouver start up, has been awarded the Red Dot Product Design Award in the Life Science and Medicine category. 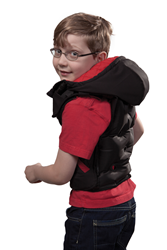 Snug Vest is an inflatable vest that provides Deep Pressure Therapy for individuals with anxiety, sensory disorders, ADHD and autism. "The accolade of the Red Dot Design Award, the ‘Red Dot,’ is an internationally recognized seal of quality label for excellent design” and is awarded annually by Design Zentrum Nordrhein Westfalen, a highly reputable German design institution. It recognizes products in 18 different categories for design excellence. Past winners include Apple and IKEA, among other prominent design companies. “Red Dot is the most prestigious product design award. We’re really proud to have recognition for all the hard work we’ve put into making a very well designed product,” says designer and Snug Vest founder Lisa Fraser. “As a start-up business, it is thrilling to be competing side by side with renowned design companies, let alone to be chosen as one of the winners!" Fraser previously won the Red Dot award in the “Design Concept” category with the Bear Hug Vest in 2011. Now, 3 years later, Bear Hug has evolved into the Snug Vest and been recognized for outstanding design. Red Dot is not alone in recognizing the Snug Vest for its superior design. Individuals who purchase it are routinely impressed by the quality of the vest. The mother of 14 year-old boy Erik Autism Spectrum Disorder bought the Snug Vest and said, “Snug Vest- I have to tell you that your design is amazing – you’ve thought of everything...your attention to detail in all areas is so impressive and is really touching." For more information on the Red Dot design awards, visit http://www.red-dot.de.